This book should have a bold sticker on it saying “Buyer Beware”. It retails for $95, on Amazon it is discounted to $76. This is an ebook! Not only is it overpriced, $1.99 would be fair, but it has very little information in it. If you have published a book through Amazon, Barnes and Noble, iTunes Producer, or any other source then you were asked to include all the metadata this book describes. There is a chapter titled “Enhancing Data to Stand Out In the Marketplace”, that basically just tells you to have an author page. Everything that is in this book can be found by a simple Google search. Based on the Amazon ranking it is not selling all that well and hopefully, my review will keep writers from thinking this text may have some benefit. I purchased this book with Amazon points, thankfully not with real cash. This entry was posted in Non-Fiction, Uncategorized by Don Grant. Bookmark the permalink. Thad McIlroy here, co-author of The Metadata Handbook. I respect your opinion and your right to form an opinion and to express it online. That’s part of the contract writers make when they publish their work: not every reviewer is going to be a fan. That you decided to publish your review also on Amazon means that we will likely suffer lost sales of the book, but that, I believe, is your intention: you don’t want “writers…thinking this text may have some benefit” and then to waste their money on our book. In the description of the book on Amazon our first sentence is “The Metadata Handbook is a one-stop guide for professional publishers, large and small…” I can see, based on your review, that we should have been more explicit: this book is not intended for self-published authors. We felt that the price tag would be evidence enough for a self-published author to “get the hint” as it were. You write that “Everything that is in this book can be found by a simple Google search.” I challenge that comment. Yes, you’ll find a lot of free material online. But most of it is either out-of-date or far more complex that the Handbook we offer. We know what’s online and have recognized our responsibility to go one better. I do want to question your credentials for writing the review. I don’t see where you have published a book, where you have engaged in the actual task of formulating metadata for a book you care about and then working to get that metadata distributed beyond just “Amazon, Barnes and Noble and iTunes” or “or any other source.” There’s much more to metadata than what’s required on those sites (and their requirements for metadata continually expand as they more fully embrace the ONIX 3 metadata standard). We have completed the second edition of The Metadata Handbook. It will be published online over the next few weeks. It does include a section specifically for self published authors. I would be very pleased to send that book to you, for free, in the hope that you may find some additional value from the revision. Please email me at thad@thefutureofpublishing and I’ll send it along. But even with that new section I hope that authors will recognize that the book is intended primarily for professional publishers and then only for the kind of serious and/or successful author who doesn’t mind spending up to $95 just to learn about metadata. That’s not all of them, by any means. 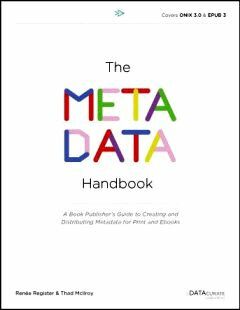 Aside from your review, we have had a lot of very positive feedback: you can see some of it on our site, http://themetadatahandbook.com/, where three of the publishing industry’s top experts on metadata do praise our book. Thank you again for taking the time to read our book and express your criticism. I hope that this note may be helpful to you in understanding the why’s of how’s of The Metadata Handbook. Most self published authors and those who oversee their publication, such as myself, take the business very seriously and have no problem in investing into it. Second, while I appreciate the offer of a free copy of the next edition, I do not accept free books, which allows me to maintain the integrity of my site. And as to the question of “credentials”, I have been responsible for the publication and discover-ability of over 20 books, so I know a little of what I speak.